Teen Titans Go! is the story of the adventures of Robin and his team of superheroes that are charged with the duty of protecting Jump City. Each of the Titans have their own distinct personalities, beginning with Starfire, an alien girl with energy powers and a serious unrequited crush on the leader, Robin. Raven is a teenage sorceress that has a deadpan, sarcastic attitude while not fighting criminals, yet her source of mystical knowledge is useful whenever her old enemies decide to drop in. Cyborg is a human/robot hybrid that has a laidback attitude toward life. He is a whiz with anything technology related; that includes building his own car from scratch. Beast Boy is green, very lazy and a bit of a prankster, often playing trick on the rest of his team mates. Whenever there is trouble Beast Boy can transform into any animal living or extinct to aide the team while fighting crime. Some of the crazy misadventures, that can happen at a moments notice, can also happen when you're a teenage superhero. Whether adventures are in the city or anywhere else, including space itself can be fun while the team is also trying to save the world everyday. Sometimes a villain can hide in plain sight by having a business as a front and it is up to the Titans to investigate before it is too late. The Titans all live together as roommates in the Titans Tower which is shaped like the letter T. While not fighting crime, the titans are often chilling out in their tower despite some of the craziness that might ensue because of their different personalities. Along with the occasional monster that is tearing up Jump City, the Teen Titans are also trying to grow up while living as roommates. Watch Full Episodes of Teen Titans Go! The competition heats up and the Titans must find a way to beat the HiveFive. Episode 9 - The Real Orangins! Episode 8 - Monster Squad! In the second part of the Flashback episode, it’s revealed how Robin changed from mild-mannered sidekick to quick-tempered leader. A flashback reveals how Robin formed the Teen Titans. As the Titans deal with Madame Rouge, Breast Boy is excited to meet his female counterpart - Beast Girl! Beast Boy and Cyborg celebrate the birthday of their friendship!. Special festive collection of Teen Titans Go! hilarious holidays specials. This week an all new episode of Teen Titans Go!. When Trigon forces Raven to attend her prom, she brings the rest of the Titans along with her to upset him. When the other Titans start listening to heavy metal music, Robin warns them of the dangers. Tired of losing to the Hive Five every year, the Titans hatch a scheme to win the costume contest. Robin creates the Teen Titans Awards in an effort to get his teammates to clean up the tower. The Justice League holds a talent competition to find a superhero worthy of joining their team and Robin tries everything to win. Robin forces the other Titans to forget about their dreams and find regular, boring jobs. The Titans build an AI robot that can create a pizza that's never been made before. 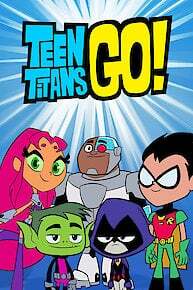 To prove his point about classic superhero cartoons, Control Freak sends the Titans to a former version of Teen Titans Go. Robin uses Labor Day as an opportunity to teach the other Titans about the importance of labor. Robin introduces the other Titans to a money-making application but they soon learn the dangers of a shareconomy. In a final epic battle, the Titans and their musician friends square off against the dragon for control of the Night Begins to Shine. The Titans return to the alternate reality to save Cyborg but will they be able to defeat the dragon? Cyborg becomes trapped in the alternate reality of Night Begins to Shine with a Dragon who wants to steal the song for his own evil purposes. The Titans become hackers to stop a gang of computer pirates. Beast Boy starts using more than 10% of his brain in an effort to find the hidden images in a puzzle. The Titans tell their slightly inaccurate origin stories. It's Cinco de Mayo, and Robin learns that avocados are a super food that gives you super powers. While the other Titans are trying to stop a cow-stealing UFO, Beast Boy gets a job to buy a moped. After Starfire kisses his hand, Robin is determined to never wash it again. It's Easter, and the Tooth Fairy is trying to take over the holiday. Robin uses his skills as a master detective to discover what happened to the animals that live outside Titans Tower. It’s St. Patrick’s Day and, after wishing to become a leprechaun, Beast Boy becomes obsessed with gold. The Titans are determined to find out what happened to the missing two o'clock hour during Daylight Saving Time. It's back to school for the Titans as they teach each other about science and grammar. Beast Boy composes a song to let Raven know how he feels about her. Beast Boy travels on tour with his song, but this aggravates Raven. The Titans have a hard time deciding who gets to choose which movie they watch on movie night. The Titans play Spin The Bottle as Starfire tries to improve her vocabulary through kissing. Robin's streak is in jeopardy when the other Titans are poached by Kid Flash. Robin is determined to continue his streak of stopping 52 crimes during crime season. Beast Boy concurs to share his birthday with Starfire after finding out she's never had one on Earth. When Santa decides to quit, the Titans pitch in to save Christmas. Batman and Commissioner Gordon check in on various happenings around Jump City. Starfire wins a goldfish at the carnival and vows to keep it alive. After being left alone at home, Cyborg and Starfire booby trap the tower for safety. When Santa tries to take over Halloween, it's up to the Titans and a few ghouls to stop him. Teen Titans Go! is currently available to watch free on Cartoon Network and stream on Cartoon Network. You can also stream, download, buy, rent Teen Titans Go! on demand at Amazon, Hulu, Vudu, FandangoNow, Google Play, DIRECTV NOW, iTunes online.